Ingrosso-släktet fortsätter att leverera, denna gång intar ingen mindre än Oliver Trädgår'ns scen! 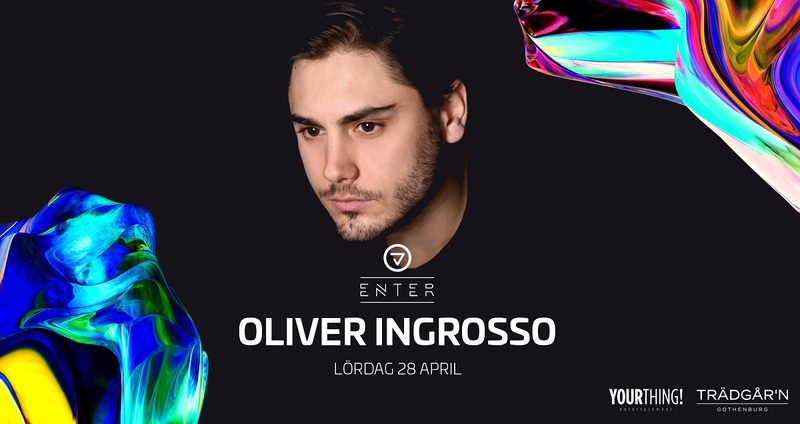 Lördagen den 28 april presenterar ENTER & TRÄDGÅR’N stolt OLIVER INGROSSO (Live) på Trädgår’n! You can easily say that the DJ-talent runs in the family. At 20 years of age he has already released his first EP, iTrack, together with Tim Bergling (Avicii) and Otto Knows on Roger Sanchez label, Stealth Records, back in june 2010. The music breathes euphoria, epic symphonies and pumping club beats. The EP has been supported by names like Tiesto, Sebastian Ingrosso and Armin Van Buuren. Olivers energetic performance in the DJ booth is total and he has already made himself a name in the business. He has at his humble age toured the world and played alongside the Swedish House Mafia, Adrian Lux and Sour Grapes, just to mention a few.